This past weekend I took a Girls Trip to Savannah, GA to celebrate a friends 24th birthday with 5 lovely ladies. I truly had so much fun exploring, celebrating, and enjoying the trip that I ended up not taking many pictures (SO unlike me). I really wanted to be off my phone and present with the people I was with! I still wanted to share what we did and give some recommendations! Friday: Time to hit the road. We sat down at our table and discussed what the evening plans would consist of and where we would go. Everyone at our table ordered something completely different off of the menu from Burgers, to Salad, to wraps and Root Beer Floats. We enjoyed our food at the Crystal Beer Parlor and I would highly recommend it. I am not a Beer Drinker, but here is a list of their Beers if you are interested! The environment was family friendly, everyone was enjoying their time, and we had great service. We had about 40 min until check in time, so we decided to go to the grocery store and get some California Pizza Kitchen Pizza, breakfast foods and waters. It was so strange because in Jacksonville we all usually go to Publix (the bomb dot com) and we went to a Kroger. I have personally never been to a Kroger, and the only negative thing I have to say was it seemed like everything was on sale, but in order to get that sale price, you had to have a Kroger card. So Ciera (one of the gals) took one for the team and got a Kroger card, and then we literally used it on all of our transactions LOL. It was finally time to check in to the Airbnb and we did not want to pay for the Meter Parking in front on the street, so we rotated girls to stay in the car while we lugged suitcases, food and air mattresses into the place. It probably looked like we were moving into the home for weeks, when in realty we were there a total of two days! Two of us went to park the car 3 blocks away while the other four waited for them to get back. We did not take too much time unpacking before we headed out to shop a little. Right next to our Airbnb were multiple shops and one of them had Popsicles… that were $4! So, yes, we spent $4 on popsicles and then walked right out into heat that felt like 100 degrees and had to fight a battle between the sun and the popsicle. They began melting faster than we could eat them. You can also Mix any flavors you want! From there, we headed back to the Airbnb to wrap up a great first night in Savannah! Saturday: Fun, Fun and more FUN! We woke up surprisingly early and decided to go for a morning walk. We ended up walking about a mile to the cutest little breakfast spot called Goose Feathers Cafe and they honestly had the most delicious Menu options. I ordered the same thing as the birthday girl, a Bagel with Turkey Sausage and Egg (SO Good) with a small iced coffee. After eating the most important meal of the day, we headed right around the corner to the shops. There were the usual shops that we have here in Jacksonville like the Gap, Victoria Secret, Mac, Anthropology and so on. We bought a few things and then headed back (Shopping bags in hand) to the Airbnb to get ready for the highlight of our day- The Savannah Slow Ride. The Savannah Slow Ride was something that we booked in advance to do from 1:45-2:45 and I would do it again in a heart beat. It is a 100% pedal powered ride, where you and fifteen other people are on a bike pedaling around town. Basically, the faster you pedal, the more stops you get to make. They bring you to bars and pubs all over the town and you can order drinks at whatever stops you would like. Just for booking the Slow Ride, there is a special menu at each stop where you get selected drinks for a discount. We made a playlist for the ride, and plugged up the phone as soon as we sat down! It was such a blast and the best part is, you do not only get those specials for the time that you are on the bike, you get them the entire weekend! Obviously drinking in the middle of the day can take a lot out of you, so we stopped for Pizza at a cash only pizza spot called Vinnie Van Go Go’s which I had been to one other time with my mother and sister. The pizza is so amazing and we ordered a large (12 slices) which was perfect for all 6 of us! From there, we took naps and then repeated the same itinerary as the night before. We headed out to Congress Street and took on the town! It was filled with cute outfits, laughter, the best memories. a special birthday, great girls and slightly embarrassing dancing. 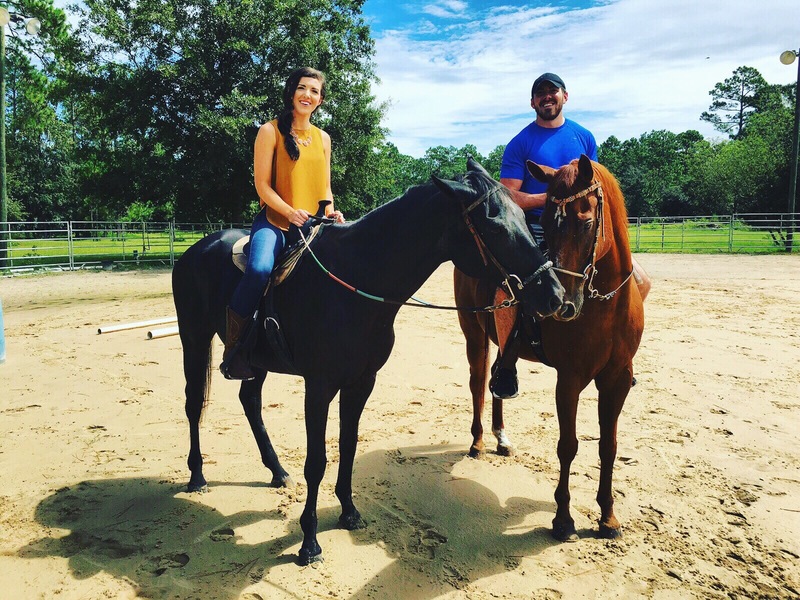 With the weather being so rainy lately, I thought it would be fun to share 5 things that I love to do in Jacksonville Fl on a rainy day. Who says you can’t make the most out of your weekend, even if the forecast is 100% rain? The Edge Rock Gym is so much fun and usually you can keep your eye out for a Groupon or sale on their site! Basically it is the most “fun” time you will have working out. It is an indoor rock climbing facility, and the more friends your bring the more fun you have! You can get competitive and race side by side, as well as enjoy different levels of climb from easy to expert. I love to go here for two or three hours with my fiancé and we literally feel SO sore the next day! It is just as much of a burn as leg day! Going to the movies is always a good time. Take time to unwind and see a good comedy, a scary movie or in my case some super hero movie with my fiancé! He is such a fan of all things super hero and Star Wars! The best way to treat yourself on a rainy day is to see a movie in a theater with the reclining seats! Just be sure you don’t fall asleep. If you are feeling a little adventurous, Autobahn Indoor Speedway is the place for you! It is a high speed Indoor go-karting facility that is super fun, but not cheap! Be prepared to spend a little money, while having the most epic go-karting experience Jacksonville has to offer. I personally love to go here because I am so competitive in nature. Fun for the whole family for sure. The most delicious breakfast I’ve had, that is unique in location/ decor is at the Cool Moose Cafe and The Fox ! These two spots will leave you stuffed and needing a nap! They have such a large menu, and the coffee is delicious! I recommend getting there a tad bit earlier than you plan on eating, needless to say they are very popular. Despite what you may think, Top Golf offers a whole lot of fun on a rainy day. For those of you who have been to one, you know that the actual building is covered. This allows you to enjoy food, drinks, and a few rounds of the golfing game with those you love most. What is more exciting than a challenge like adding rain to the equation? Top golf is fun, challenging and a great place to spend time with friends and family! So next time there is a rainy day in Jacksonville, now you know the top 5 places you should go! I hope you all have a wonderful week. The first is a dress, called The Bonnie Dress, is a perfect Off The Shoulder beauty to pack for that quick Island Getaway. I love the color and print so much, and it can easily be dressed up with a pair of heels or down with a pair of sandals. I will be taking this beauty from sunset strolls on the sand to dinner with my Fiance. The Second look is the gorgeous show stopping (literally) Naomi Romper. A romper is always a good idea, and this one has pockets! I mean nothing is better than being able to stick your favorite lipstick in your pocket and head out for a fun night on vacation. I love this romper because it is so feminine, functional and FUN. Personally I pair this piece with cute heels and head out for a night of dancing, boating and just true resort living. I hope your weekend was amazing! My Fiance and I took a little trip down south this weekend to Orlando and enjoyed food, parks and quality time! Speaking of traveling, there are some weekend get-aways that you just need a good duffle bag for, am I right? Suitcases are fun, but nothing says last minute weekend trip like a cute duffle with your Monogram on it. Jon Hart has an very special new color out “Rose” and she is gorgeous, like you! I enjoyed her this winter in a duffle and makeup bag, because what more can a girl need? Jon Hart’s new Rose was a pretty pop of pink for Winter, but I think it goes great for our upcoming Spring Season. The Makeup bag is a perfect little gift for your gal pals or yourself. As a bride-to-be myself, I think they make a good “Brides Maid Proposal” Gift! Jon Hart has everything from Duffels, Garment Bags, Suit Cases, Backpack and more, ps. it looks better with your Monogram on it! Thank you Jon Hart for Sponsoring this post! Hi guys! Happy Friday, today I am sharing my Roadtrip playlist with you! My Fiance and I are taking a little weekend trip so I have created a very fun version of a Roadtrip Playlist! Below are all the songs that we will be jamming out to on the trip, but to be fair we had to pick songs we BOTH love.. so here are my picks (labeled Hers) and his picks (labeled His). Enjoy! We are jamming out to our playlist! Happy Tuesday! I hope everyone had an amazing Labor Day weekend. 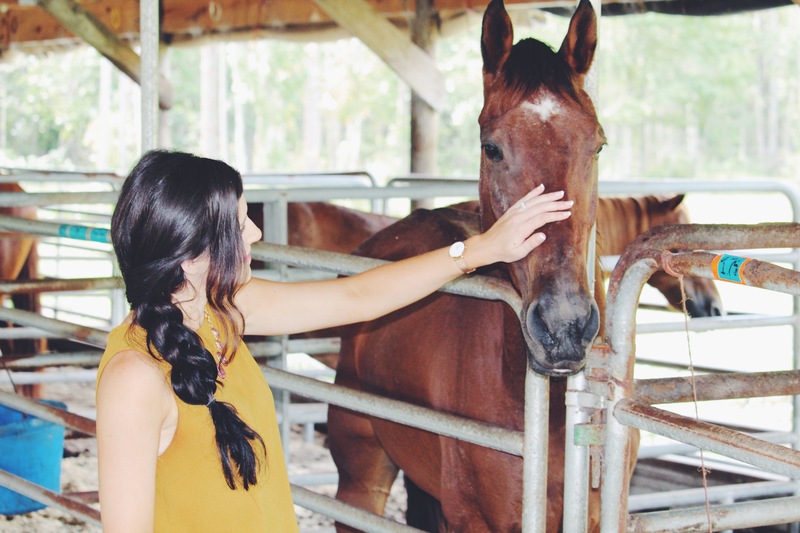 I spent my Saturday at Haven Horse Ranch! 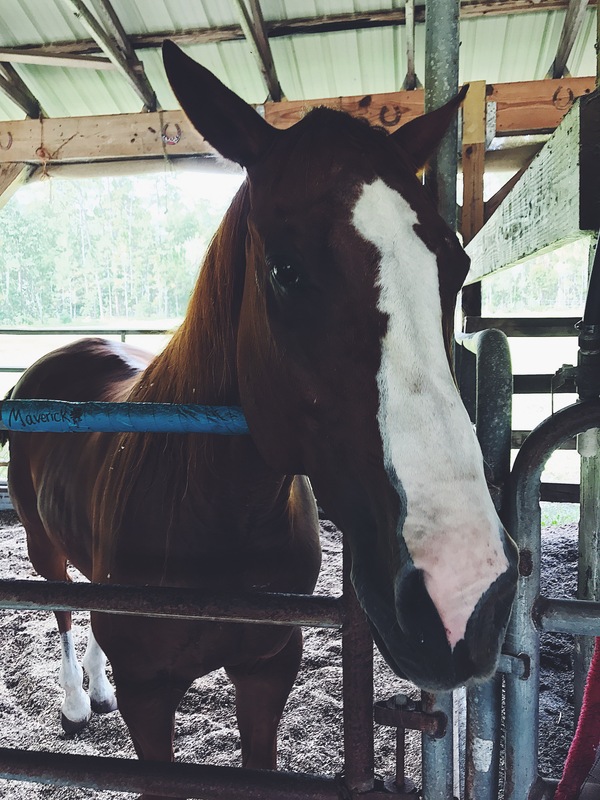 I learned how horses think, how to groom your horse before riding, and had an amazing lesson. There is currently a Groupon out there for anyone who wants to have a similar experience to mine. I arrived at 10:00 a.m. this Saturday with my Fiance, and met with out instructor. 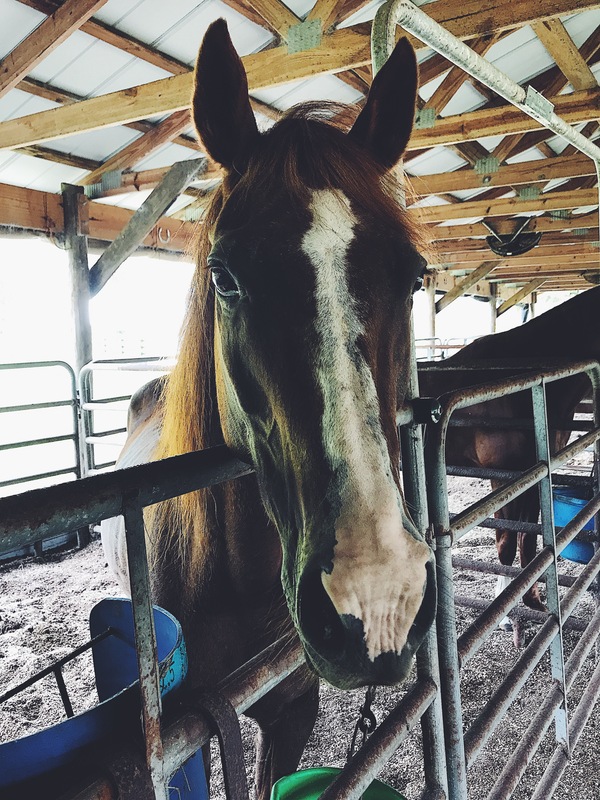 We have been horse back riding in the past many times, and no one has taken the time to explain to us in depth how a horse thinks, like Haven Horse Ranch did. 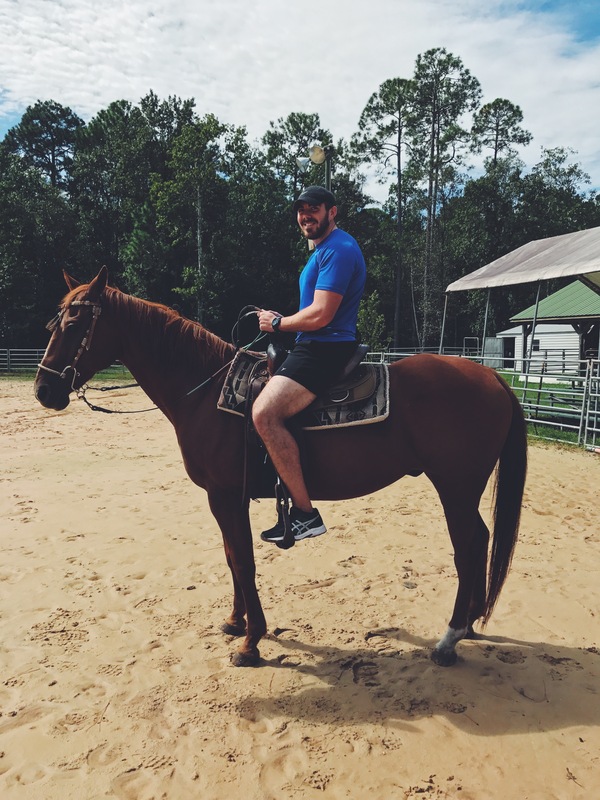 Not only did I personally gain knowledge on horses that I did not know before, I felt more confident getting on my horse and had the best riding experience of my life. How does a horse think? I do not want to spoil the details for those of you considering booking a lesson, but I will share my favorite piece of information with you! 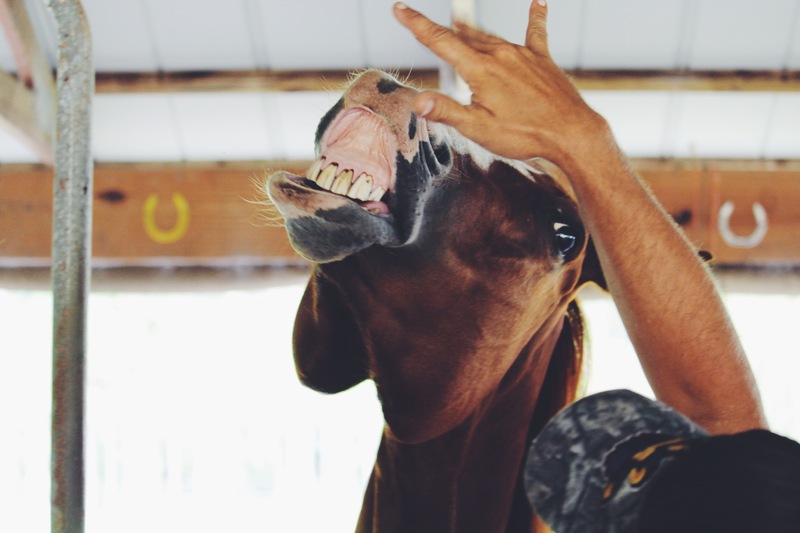 Horses are like 4 year olds. Yes, they do not have the ability to make good decisions, they are reliant on your guidance and will follow your command as long as you are “alpha”. Now, I am not saying horses are dumb in any way, however they are stubborn and if you let them be the leader on a trial ride, during a lesson etc, you will be putting your own fate in their hands. 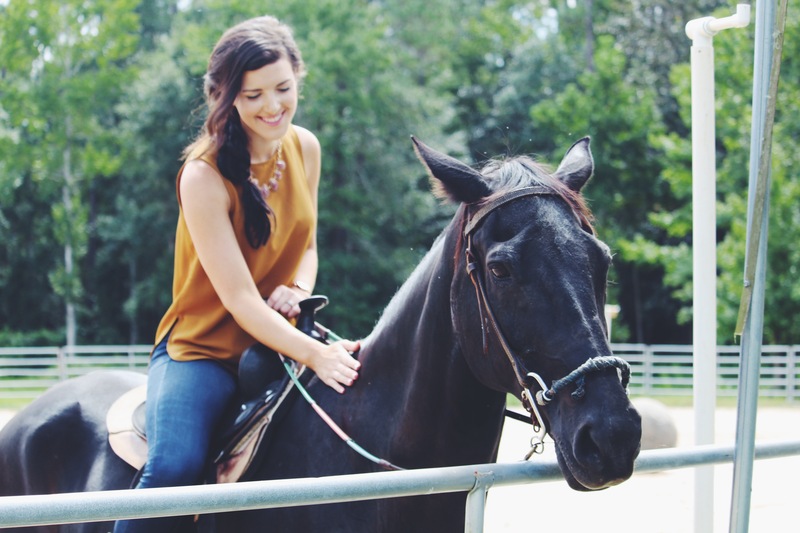 A lot of people see the glamorous “horse back riding” and when something goes wrong, they blame the horse. By establishing you are the leader from the begining, you are now in charge of every move that horse makes, and you cannot blame the horse since you are in charge. 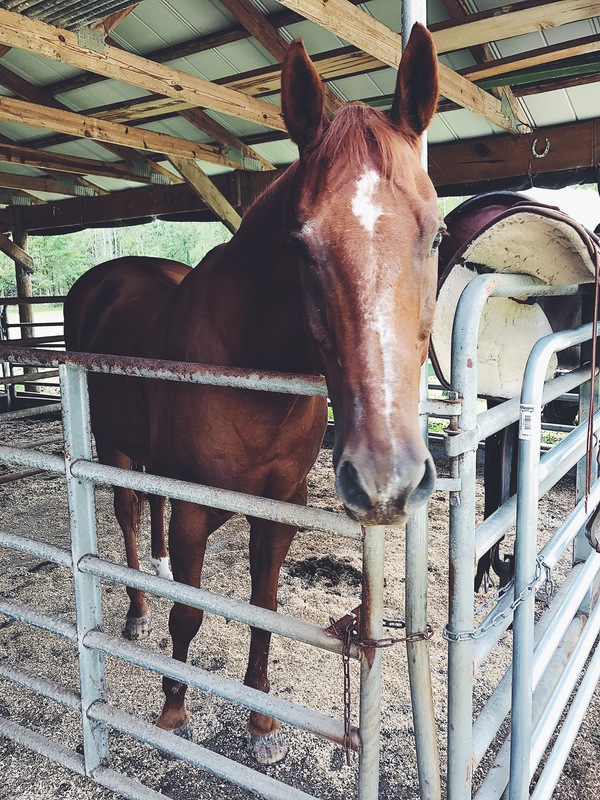 So how did I personally become Alpha to my horse? During my lesson, I made the choice to turn right, turn left, walk on etc. I did not allow my horse (Stetson) to make that decision for me. If I made my right turn and he decide not, I did it again. (Horses are also stubborn like 4-year olds). I have never enjoyed horse back riding until this past weekend. 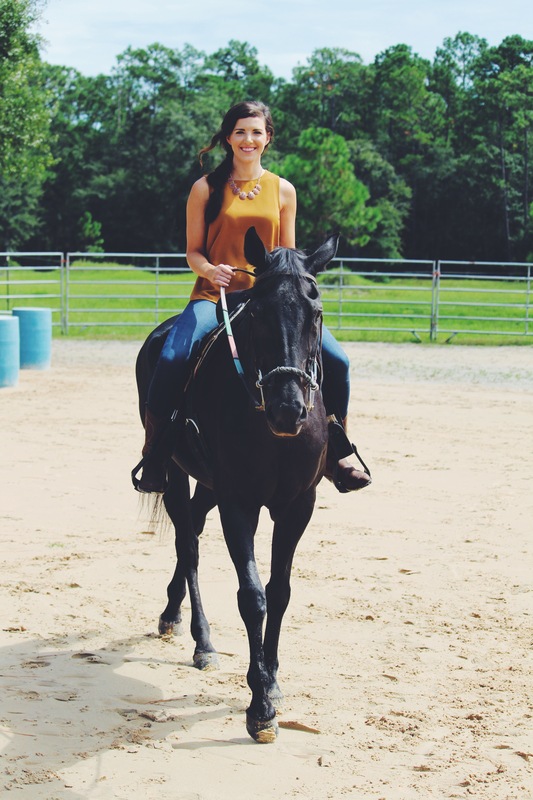 I was not scared that Stetson was going to start running or kick me off, because I was his leader and it made me feel so confident as a rider. 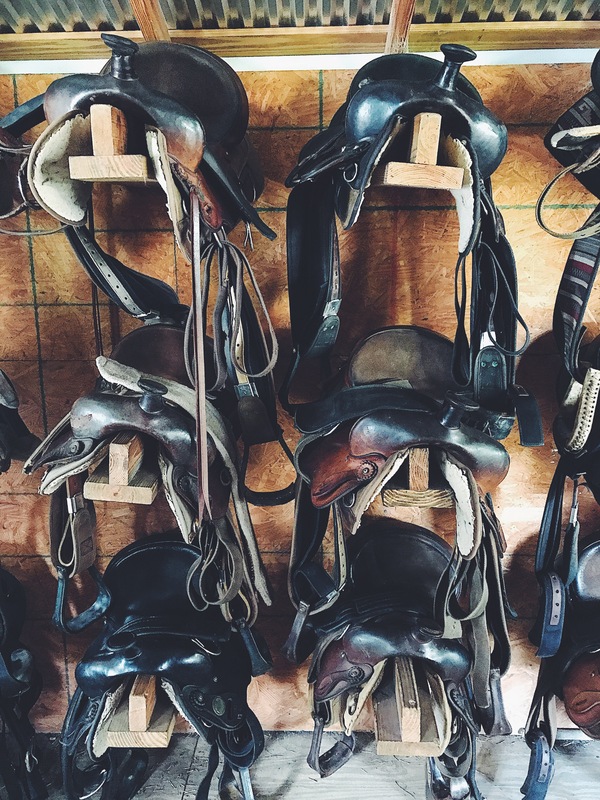 Horses are alot of work, and require care and proper maintenance prior to throwing on the saddle. You would not just jump in your car for a road trip without making sure you had enough gas, the oil was topped off, tire pressure was suitable etc. The same thought process should apply to horse back riding. 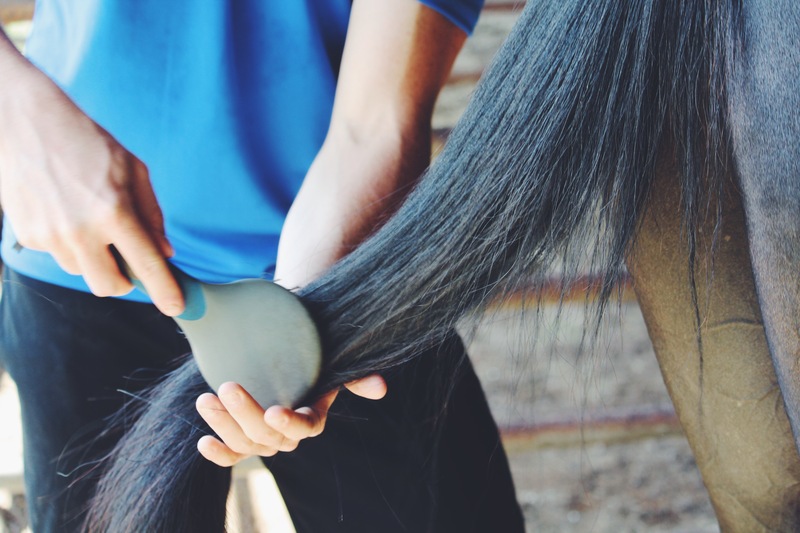 You need to make sure the horse is groomed prior to placing the saddle on, to ensure the best riding experience for the horse and yourself. The first thing I did was take the Curry Comb and comb through Stetson’s hair in a circular motion. This stimulates the hair, and brings up dirt that is sitting in the hair to the surface. 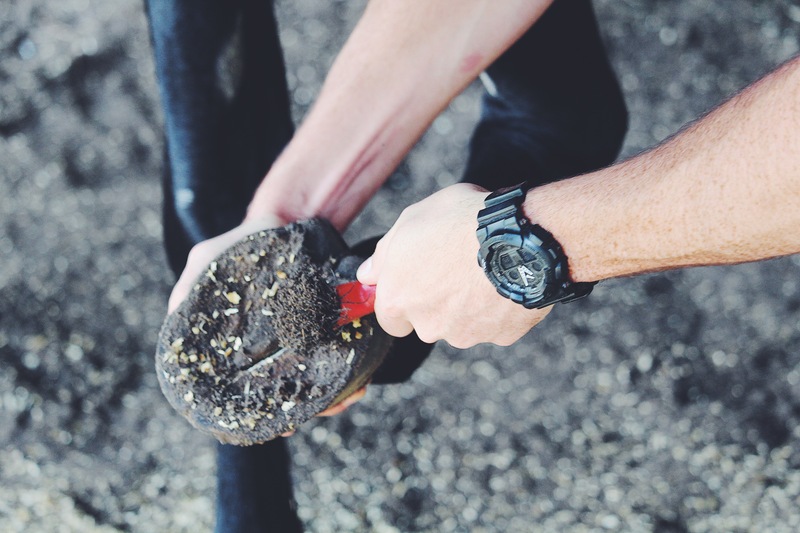 This I used to remove the dirt from the horses hair, in a flicking motion with your wrist. You will start to notice some of the shine within the horses coat coming through as your progress. The Soft Brush I used in long strokes, brushing front to back smoothing down the hairs. I used the Hoof Pick to remove dirt from all four Hooves. Just like you do not step out of the house without brushing your hair, Stetson got a nice detangling brush through his mane and tail. Now groomed, we are ready to ride. 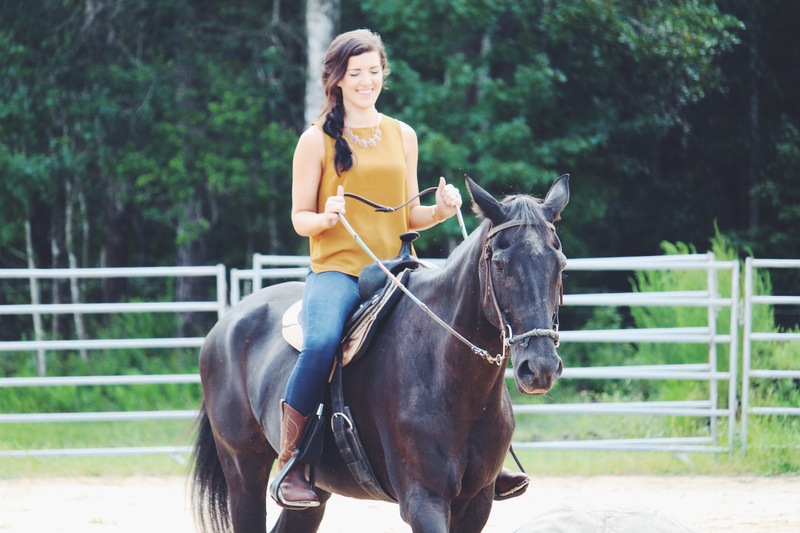 My fiance Joseph rode Tex (my personal fav, he is so “pretty” to look at) and I rode Stetson. 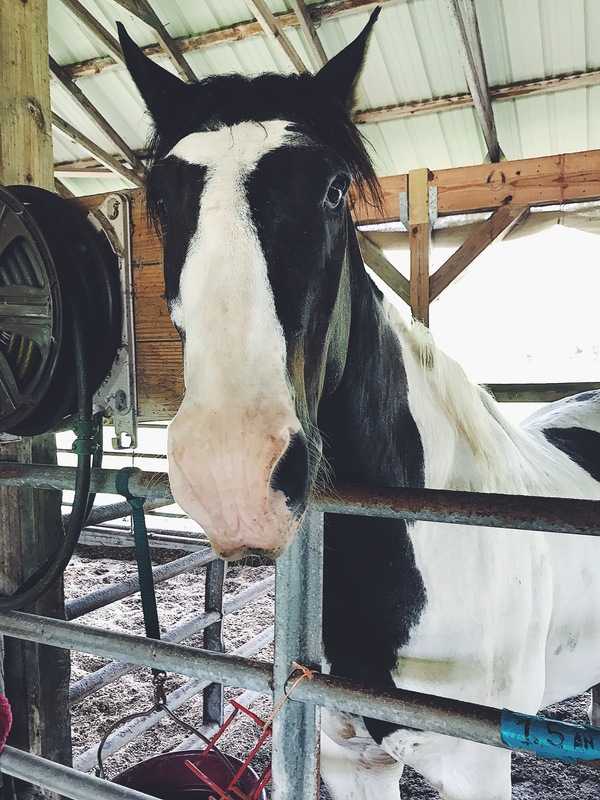 It is very interesting to see how each horse has its own unique personality, which really shows throughout the lesson. We started by sitting on our horses and learning basic commands. We then freely rode around on our horses giving commands at our own will. 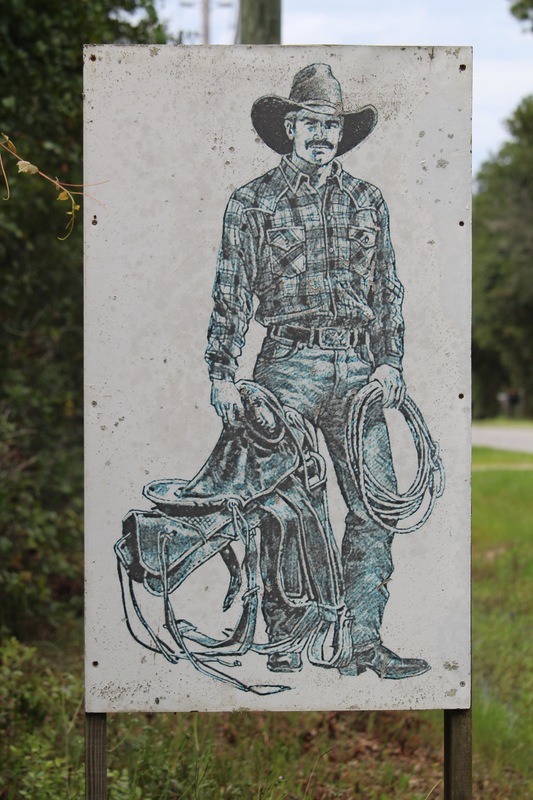 Whether it was turn right, turn left… Stetson was stubborn but if I told him twice he was sure to do what I asked. 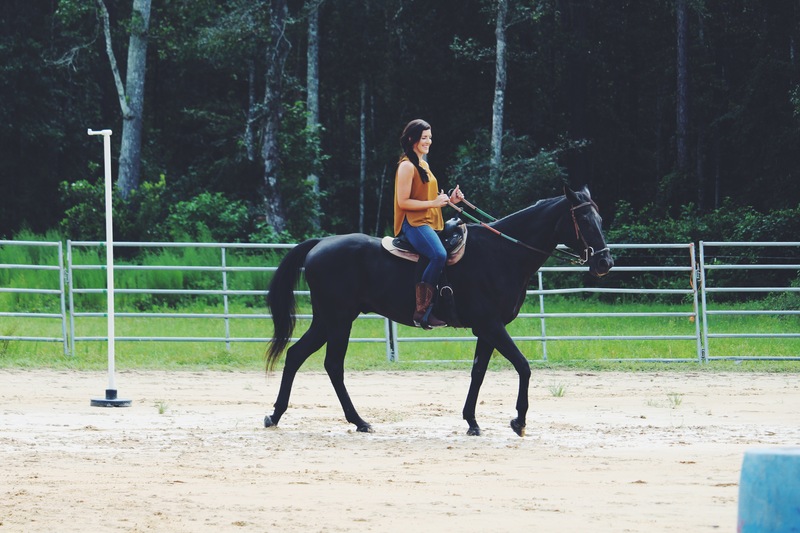 I was always fearful of riding because I felt that I simply did not have control of the horse. 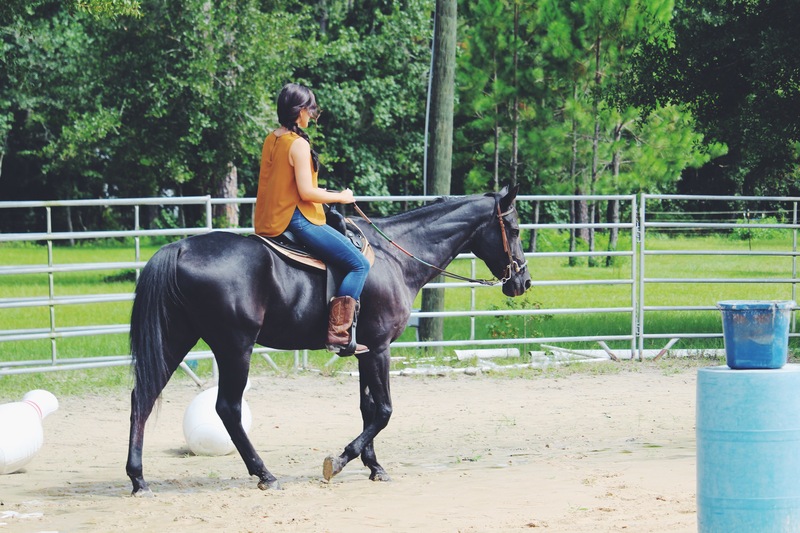 Haven Horse Ranch really grasps the concept of properly preparing you to have the most enjoyable lesson possible, while being in control of your own ride. I got to practice barrel walking, I would say racing but I don’t think I rounded the barrels at more than 5mph. That was my favorite part of my lesson, because I learned how to direct Stetson properly, turn the barrel and instantly head toward our next target. There are a few “bad habits” that people will have during there time on a horse. Mine was looking at Stetson, yes he was a “pretty horse” but do you look at your cars hood when you drive? Would you be able to drive from your house to a new city by only looking at the hood of your car and not at the road? No. I had to stop looking at the top of Stetson’s head and focus on our “target” aka where I wanted to go. This was a huge game changer, and from then on I could properly guide Stetson where I wanted to go, which made it easier on the both of us. 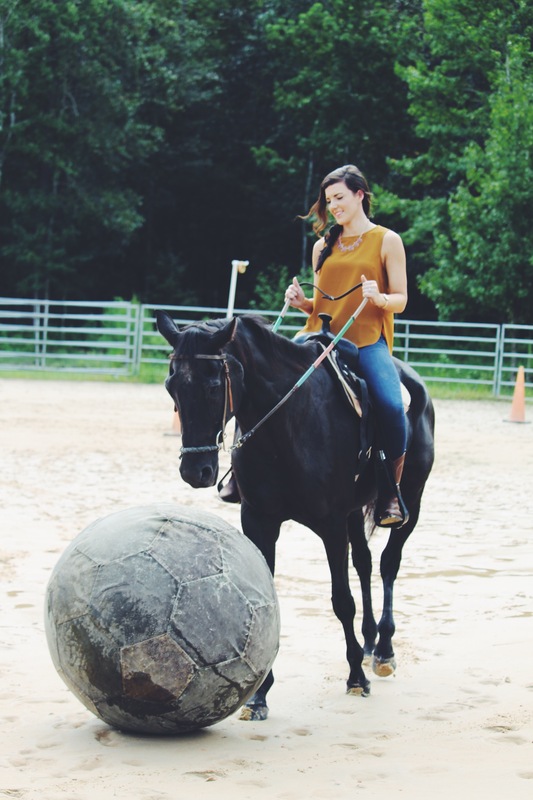 There were all sorts of fun games we played, Horse bowling, soccer, barrels and so on. What an amazing experience on a horse. 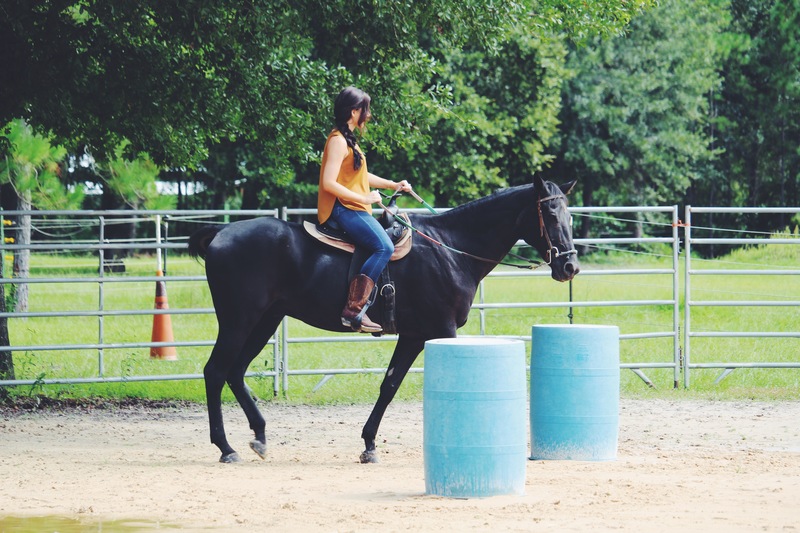 The revenue from your riding lessons helps to provide therapy for people with Autism, MS, MD, Cerebral Palsy, Down’s Syndrome and more.. The best all around personality goes to this guy? This past Sunday Evening, my Fiance and I had the most amazing experience at the Melting Pot in Jacksonville FL. To start things off, let me give The Melting Pot a proper Introduction for those of you who have not experienced the Interactive Dining Night Out. Something worth noting as you arrive to the restaurant, is to make a reservation. Making your reservation is important because it allows the staff to better serve you. It was just myself and my Fiance, so we had a reservation in “Lovers Lane” as they would call it. This is very special, because your seating is very intimate and you are sectioned off as if you have a private room. (VIP status right?) Lovers Lane is perfect for Celebrating an Anniversary and even a proposal! When you make the reservation be specific on what you are celebrating, they will make it their mission for you to have a PERFECT night. (Like showering your soon to be Fiance with Roses on the table prior to you dropping on one knee). With the cheese Fondue, you get a variety of dipping options. Bread, Green Apples (My FAV), Broccoli, and Carrots. Don’t be shy! If there is something in particular that you like to dip (Any Bread Lovers out there?) just be sure to tell your server. They will bring you more, or even replace the options you don’t want with the items you love. Salad Time: I love salad, and it was so hard for me to resist my ususal go-to… a Caesar Salad. I was sold on the Melting Pot House Salad, with the Sweet and Tangy house made dressing! (I wanted to bottle this up and take it home with me. SO GOOD). Joseph got a Caesar Salad, with Pine Nuts on top! For anyone who just loves KALE they have a Kale Caesar Salad too. Cooking Style: Next we chose our cooking style for the meats. Seasoned Court Bouillon was the winner, it is a light seasoned vegetable broth. It was so easy cooking our own meats at the table. There are a few ways to go about it. The table is set with the meats (or Seafood etc.) that you chose off the original Menu, along with some vegtables. it is recommended that you cook the vegetables in the pot for 2 minutes and the meat for 3 minutes. 3 min being well-done. The pieces of meat are small, and you cannot “burn” them, so feel free to leave them in there a while longer. There is a “Search and Rescue Spoon” that is given to you, just in case you lose that piece of food in the cooker. Some People (Mostly Men) who love to eat instantly and not wait around, will dump all of there food in at once. Then using the search and rescue spoon, retrieve everything and devour it. I made Joseph eat slowly and enjoy the experience, although I am sure he would have opted for the “dump everything in” method. Attention Sauce Lovers: There is a multitude of sauces served with your course, from tangy to sweet, you can mix it up or try one of every kind.. like me! As you can see we thoroughly enjoyed the cooking experience. The slow-pace dinner gives us time to really unwind, enjoy the food and just enjoy being in each other’s company. Chocolate Fondue: The best part of the four course meal was hands down the chocolate fondue. My eyes are always bigger than my stomach when it comes to sweets. Out of all the delicious choices of chocolate, we agreed on the SMORE’S Fondue (YES, they really have that). The chocolate Fondue is served with fresh strawberries, blondies, bananas, pineapple, marshmallow treats, pound cake and brownies. (*Gluten-free dipper plate available upon request.) With everyone having different food preferences, The Melting Pot will accommodate vegans, vegetarians, gluten-free etc. You can bring your own Vegan Chocolate and they can make the Fondue for you! That’s a wrap on my experience dining at the Melting Pot. (I am already thinking about going back this week to try another course selection) The quality food, delightful service and experience is what makes it all worth it. The Melting Pot is a unique dining experience. Something that sets them above the rest is there options on table settings. They have a intimate table for two with the single burner (like my experience) They offer a table that two burners, or three burners etc. and as if you couldn’t have a bigger party they have rooms that comfortably open up to seat 48! This room is like no other, and the perfect setting for a large family, a business meeting, or to celebrate with friends. The walls are filled with wine of all sorts, and you are sure to feel special. There are rooms within the restaurant with walls that can be removed for larger parties as well. At the Jacksonville Location, we happened upon the plaques on the wall that recognize their individual employees and give recognition for outstanding work performance. I think it is clear that The Melting Pot cares just as much for its Employees as they do their Customers. Don’t forget, the Chocolate and Cheese Fondue is 1/2 off during Happy Hour! Follow the Instructions and GOODLUCK! Winners will be announced Here: Allison, Kristina and Niki! Congratulations! If you are looking for the perfect GNO (Girls Night Out) you’ve just found it. Sweet Pete’s and the Candy Apple Cafe are the perfect combination for an epic night out with the girls. What is Candy Apple Cafe? So, let’s get to my GNO with my two of my best friends Peyton and Cierra! After a long work week, we all met at the the Candy Apple Cafe 6pm sharp to unwind with a delicious Candy Cocktail. Let me warn you, it was so hard to choose which one I wanted to get. Their Cocktail Menu is amazing, I resulted to asking our server what the sweetest Cocktail was… final decision: Sweet Pete’s Watermelon Sour. Cierra (left) got the Golden Ticket and Peyton (right) got the Blackberry Basil Mule. What I love about the cocktails is that they are not all overkill Sweet… it gives you and your girls the perfect variety to satisfy your individual drink style. What makes the Candy Apple Cafe a destination for a GNO is obvious when you walk through the doors. The decor is eclectic, fun and Instagram-worthy. Cozy up in a corner booth, take a seat at the bar or socialize in a center table. We spent an hour in the cafe before our Candy and Cocktail class, and it flew by. Catching up over CANDY cocktails, is hands down the best way to start your weekend. Next up, we made our way to the Candy and Cocktails Class. I have never in my life made any type of candy, all three of us were blown away at how fast, few ingredients and simple technique it took to make a lollipop. (Like the ones you see at Disney World). All Candies are made with the same Ingredients but the temperature you cook them at is what makes the different types. The Lollipops that we made are cooked to 310 degrees and then harden after 60 seconds from the air. Sweet Pete’s uses natural stone during this process. What makes Sweet Pete’s the best place to make and purchase candy… it is all made by hand. Most companies use machinery to produce different candies, Sweet Pete’s is unique and they are all about the candy making experience. To get that “Swirl” effect you see in the candies (red and white) we learned that you have one square block of the white and cut long rectangular strips and place it on top of the white. The light and stone allow the sugary goodness to melt into each other, and by twisting this together, there you have the swirl. Everyone in the class got to go up and make two lollipops to take home. You will have to take a class yourself to fully experience the candy making process, we already want to go back! This was the fun part, we started with a glass that had a few ice cubes in it. Then we took the jigger and measured out the Bourbon, added the shot of whiskey, had the option of two different flavored bitters (orange and berry) and lastly added in a small piece of the candy we made! Tip: The longer you let the candy sit in the glass, the sweeter your drink will be. A big thank you to the best Candy Maker, we had to get a picture with him afterwards. One thing I will compliment, is that the staff genuinely loves their jobs which makes your night out Amazing, it is like one big party. As if we weren’t in a sugar coma yet.. off we went to the DESSERT BAR. I had a Birthday Cake Milkshake with EXTRA sprinkles on top, Cierra had a Dipped Key Lime Pie Bar, and Peyton had a Cookies and Cream Ice Cream Cone. Last but not least, we had to take some of these sweets home with us. So we headed over to the Candy Shop and filled up our CYO (create your own) candy boxes. Just like this perfect take home box, our Girls Night out was PERFECT. We got to catch up, learn how to make candy, cocktails, laugh and just have fun. Sweet Pete’s and the Candy Apple Cafe give you the perfect excuse to hang out with your girls, dress up, and have fun. Plan your next night out, class, or sweet treat. A big THANK YOU to Sweet Pete’s and Candy Apple Cafe for having us! A GNO we will never forget. The Salt Life Food Shack in St. Augustine FL is known for it’s Savory Sea Food, “Take it Easy” atmosphere, and Live Music. The location itself is completely multifunctional, whether you are bringing your kids to grab a bite to eat (Patio Seating), entertaining a business client (Inside Seating) or celebrating something special (Roof Top Deck)… there’s a seat for you. Patio Seating (Level 1): This is where we enjoyed our food, listened to live music and just relaxed. The outdoor patio is very casual, bench style seating is available, each table has an umbrella (blocking that Florida sun) and the Live Music is set up in the corner. Directly in front of the Music there is a first come first serve seating area (cushioned seating) where families and couples can sit and wait for their table, or even enjoy a full meal. The staff will bring you drinks, food and even help entertain those little ones who can’t sit still at a table. Now it is time for the Teasers (aka Appetizers), I ordered the Fried Calamari and it was amazing. The calamari was fresh, tender and best dipped in the Shack Sauce. This was my first time trying calamari, so thank you Salt Life for hooking me! Now onto the Main Menu, I went fried for the appetizer so I decided to go fried for dinner too. I ordered the Southern Fried Shrimp: Seasoned Hand-breaded Shrimp Fried to absolute perfection. And Joseph ordered the Wood-Grilled Mahi Fish Sandwhich with a side of Black Bean Orzo… which he devoured in 3 minutes. After we finished our desert, we got our picture taken and placed on a Salt Life Post Card! This is something that is free to all customers, on the post card itself you will find your picture in the center, the current specials, and a coupon for a Free Appetizer during your next Visit. Your photo is also available for Purchase. See ours below! This guy was amazing, and usually plays on Wednesdays and one Saturday a month. A Huge THANK YOU to Salt Life Food Shack St. Augustine for having us, and Marcos, you and your team were amazing!